The time has come. With the year wrapping up, the results are in, and needless to say, 2015 was a pretty good year for movies. A few early year dark horses actually broke the traditional “doldrums” period and made people go to the movies in February and March. However, not every box office entrant was worth the price of admission. Here are my votes for the worst movies released into theaters this year. Obviously, these are opinion based and I highly welcome any arguments! 10.) San Andreas: You would be hard pressed to find an action movie with the Rock “boring”, but this natural disaster movie is right along those lines. The age of interesting natural disaster movies has long since passed. 9.) Hot Tub Time Machine 2: There isn’t purely anything inherently wrong with making a sequel to a one hit comedy movie. However, when they don’t break any new ground and are just rehashing all of the jokes from the original without even making the story improved or different, it becomes one of the quintessential problems with movies today. 8.) Tomorrowland: Wondrous visuals and whimsical characters can’t make an audience ignore Introducing villains in the last 20 minutes of the film, going on for over an hour without showing any relevant plot development, and having entirely too much exposition. Nothing could save the Fantastic Four this year. 7.) The Gallows: Having an entire cast of obnoxious, self-centered and outright moronic teenagers was bad enough since we got plenty of that in Unfriended, but unlike that movie, this at least took advantage of the elements of found footage. Although, it did have one of the best endings of any horror movie that year. 6.) Pixels: This was a horrible film, to be sure; as well as a near blatant rip-off of an episode of Futurama. However, it was not even the worst Happy Madison film, let alone the worst of the year. The worst aspect of it was a movie that wouldn’t have worked even in 2000 has no business being made in 2015. No one wanted to be friends with We Are Your Friends this year. 5.) We Are Your Friends: A film about a niche that most can’t relate to, with a cast that few consider objectively talented, with a title that makes little to no sense in any semblance or relation to the story. Arguably the biggest bomb of 2015. 4.) 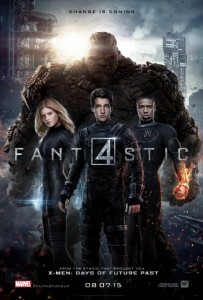 Fantastic Four: Bad luck just continues to plague this poor franchise as Marvel’s first family not only had the biggest comic book movie bomb since Steel, but it was bad enough that Fox pulled the plug on any sequels. 3.) Monsters Dark Continent: How can a movie about humans battling Lovecraft-inspired monsters in a dystopian future be bad? If you forget to really include any interesting confrontations with the monsters. 2.) 50 Shades of Grey: A notoriously bad, pornographic novel turned into a PG-13 movie. Nothing else really needs to be said here. 1.) Jupiter Ascending: Everything that was wrong with Tomorrowland including ridiculous acting, less character development, and enough exposition to write a long, intricate, overly complicated book. Green Inferno: While there will never be a movie that is a part of the “tribal cannibalism” sub genre that will ever be considered an objectively good film; however, there was also nothing objectively wrong with what it set out to do.